Critics have described some of the federal government’s austerity over the past several years as “penny-wise and pound-foolish.” Across-the-board spending cuts may have reduced short-term budget deficits, but they also slowed economic growth and job creation while undermining long-term investments in infrastructure, education, and innovation. Some cuts, however, not only damaged the economy, but also targeted sectors of the federal budget devoted to preventing wasteful spending or ensuring that the government collects revenues efficiently and fairly. In short, those spending cuts cannot even be described as penny-wise. It may be counterintuitive to imagine a spending cut that increases deficits, but when cuts hinder competent program administration and oversight, the resulting increase in waste, fraud, and abuse is often larger than the related spending cut. Everyone agrees that waste, fraud, and abuse should be prevented in federal programs, but making that happen is easier said than done. Competent administration depends on adequate staff and resources, and rooting out cheating and corruption requires strong oversight. This issue brief identifies four sectors of the budget where spending cuts have increased deficits: the Internal Revenue Service; inspectors general throughout the federal government; program integrity for major health care and disability programs; and funding to help Congress make better budget decisions, with a focus on the Government Accountability Office, or GAO. Official federal government sources calculate a return on investment for each of these sectors, which this paper uses to estimate the increase in waste, fraud, and abuse that resulted from budget cuts at these agencies since the end of fiscal year 2010. This issue brief applies return on investment ratios as carefully and conservatively as possible to avoid overstating the consequences of these budget cuts. Ultimately, the estimated increases in waste, fraud, and abuse presented here should be understood more as an approximation than an exact figure. Relative to inflation-adjusted FY 2010 levels, cumulative budget cuts for the Internal Revenue Service, inspectors general, program integrity initiatives, and the GAO totaled approximately $6.3 billion from FY 2011 to FY 2014. 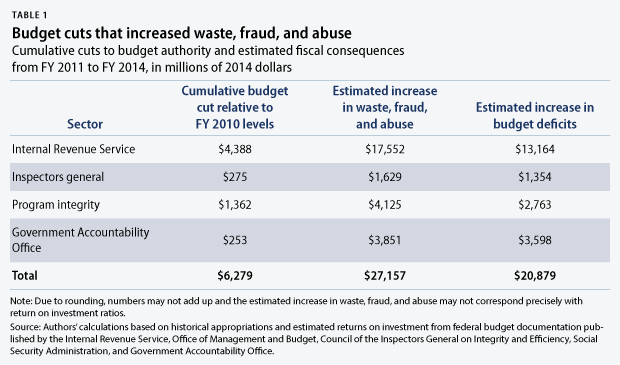 (see Table 1) Based on data culled from various federal government sources, those cuts increased waste, fraud, and abuse by around $27.2 billion over the same time period. Combining the fiscal savings from the cuts with the resulting increases in waste, fraud, and abuse yields an estimated $20.9 billion in higher budget deficits as a consequence of these misguided austerity measures. To be clear, most government spending does not pay for itself; the programs covered in this issue brief represent only a small fraction of total federal spending. However, austerity has reached a point where even initiatives to reduce budget deficits are hampered by funding cuts, since there is no low-hanging fruit left in the parts of the federal budget most affected by cuts. The sectors profiled here are almost all funded by discretionary spending, the portion of the federal budget subject to the harsh spending caps imposed by the Budget Control Act of 2011 and its sequestration rules. Policymakers should not allow misguided short-term deficit concerns to justify continuing austerity instead of acting decisively to support our struggling economy. For example, the medium-term budget outlook would remain stable even if Congress repeals sequestration without replacing it with offsetting deficit reduction. Even supporters of today’s austerity should agree that Congress must immediately reverse spending cuts that are increasing budget deficits. Recent budget cuts at the Internal Revenue Service, or IRS, are a prime example of how spending cuts can increase deficits—in this case, by enabling fraud and abuse within the U.S. tax system while making it harder for ordinary taxpayers to understand their tax obligations. The IRS periodically estimates the difference between taxes actually collected and the amount that would be collected if everyone complied fully with tax laws, known as the tax gap. In 2006, the last year for which data are available, the tax gap was $385 billion after including revenues from delinquent payments and enforcement actions, which means that the IRS successfully collected 85.5 percent of the taxes owed for that year. In comparison, the entire federal budget deficit was $248 billion in FY 2006. Even those who oppose tax increases should at least agree that everyone ought to pay the taxes they owe under current law. Yet over the four-year period from FY 2011 to FY 2014, the IRS budget was cut by a cumulative $4.4 billion relative to inflation-adjusted FY 2010 levels. The IRS estimates that every dollar of its overall budget yields $4 in additional tax revenue, which suggests that the tax gap was $17.6 billion higher from FY 2011 to FY 2014 than it would have been without budget cuts. The effects of applying across-the-board budget reductions to the IRS over the past three years underscore the importance of making this concerted effort [to adequately fund the IRS]. If the government continues to underserve its taxpayers, it risks further undermining public confidence in the fairness and integrity of the tax system, and thereby reducing tax compliance. While no one wants to be audited, taxpayers deserve adequate access to tax guidance services and competent enforcement of tax laws. Everyone benefits from the public services that tax revenues fund, and when individuals or corporations cheat on their taxes, honest taxpayers effectively subsidize the free riders. In addition to cuts to the IRS that enable fraud and abuse in the U.S. tax system, cuts to the budgets of inspectors general prevent them from combatting waste, fraud, and abuse in the agencies they are tasked to protect. Currently, 72 independent inspectors general across the federal government conduct audits and investigations to prevent corruption and recommend methods to increase program efficiency. Inspectors general are often the first to uncover high-profile cases of waste, fraud, and abuse. For example, top officials at the General Services Administration lost their jobs when that agency’s inspector general issued a report detailing excessive spending on a conference in Las Vegas. The resulting scandal led to a governmentwide effort to reduce travel costs, with such spending falling about $2 billion in FY 2012 relative to FY 2010 levels. Separately, the Office of the Special Inspector General for the Troubled Asset Relief Program has uncovered financial crimes that led to more than $4 billion in restitution payments to victims and the federal government, as well as criminal charges against more than 100 bank executives. Congress created this office to oversee funds disbursed under the Emergency Economic Stabilization Act of 2008, commonly known as the financial bailout. Despite the clear fiscal benefit that inspectors general provide by enhancing the efficiency of government agencies, Congress cut the combined budgets of inspectors general by a cumulative $275 million from FY 2011 to FY 2014, relative to inflation-adjusted FY 2010 levels. The automatic spending cuts in FY 2013 due to sequestration caused about $100 million of these cuts. In FY 2013, the last year for which data are available, investigations by inspectors general yielded $14.8 billion in fines, restitution, settlements, and other financial consequences of criminal or civil legal action. That represents a return on investment of $5.92 for every dollar of the collective $2.5 billion budget for all 72 federal inspectors general. The return on investment increases to $21 for every dollar spent when the calculation includes potential savings from recommendations made by inspectors general and agreed to by agency leadership. Based on the more conservative return on investment estimate of $5.92 per dollar, budget cuts prevented inspectors from finding $1.6 billion in savings throughout the federal government from FY 2011 to FY 2014. Inspectors general do more than save money—they strengthen government services and protect citizens from abuse by government officials. For example, the inspector general for the Social Security Administration, or SSA, reduces improper benefit payments, helps protect personal information from cyberattacks, and identifies ways to improve customer service for Social Security beneficiaries. The inspector general for the U.S. Department of Justice investigates criminal behavior by law enforcement officials, such as a recent case in which a Drug Enforcement Administration officer improperly used federal government databases for a side business as a private investigator hired by financial institutions to repossess vehicles. Congress recognized in the Budget Control Act of 2011 that spending a little bit of money to stop waste, fraud, and abuse in major government programs was a good investment by creating exceptions to the law’s spending caps for program integrity at the Social Security Administration and the U.S. Department of Health and Human Services, or HHS. Since 2012, however, Congress has underfunded these investments by a combined $1.4 billion in 2014 dollars. These cuts caused backlogs, poor customer service, and $4.1 billion in lost potential savings. Program integrity initiatives ensure that federal dollars are spent in the way and for whom they were intended. Within HHS, for example, the Health Care Fraud and Abuse Control Program—which saves $1.50 for every dollar spent—protects our nation’s most vulnerable citizens receiving Medicare, Medicaid, and Children’s Health Insurance Program benefits from those who would take advantage of them to steal money from taxpayers. For example, a Georgia dietician was recently sentenced to 16 years in prison and ordered to pay $4 million in restitution after a joint investigation by the HHS inspector general, FBI, and state officials found that the dietician stole the identities of low-income children to fraudulently bill Medicaid for medical services that were never provided. Similarly, SSA employees conduct continuing disability reviews and Supplemental Security Income, or SSI, redeterminations to ensure beneficiary eligibility. A continuing disability review ensures that beneficiaries still meet the strict medical qualifications for disability benefits, and a redetermination checks whether SSI recipients remain without the financial resources that would disqualify them from this modest benefit. By ensuring the fair administration of these critical social insurance programs, the federal government saves approximately $4 for every dollar spent on redeterminations and $9 for every dollar spent on continuing disability reviews. 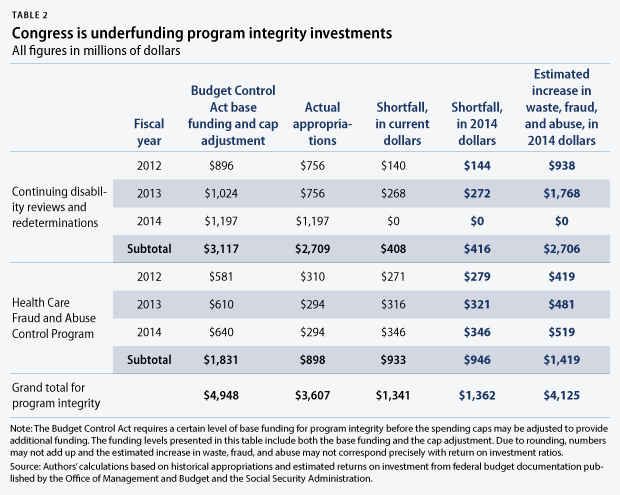 Congress’s failure to fully fund program integrity makes the government less efficient and wastes taxpayer dollars. Congress controls all federal spending. Article I, Section 9, of the U.S. Constitution states, “No Money shall be drawn from the Treasury, but in Consequence of Appropriations made by Law.” Ultimately, it is up to Congress to spend federal dollars wisely and prevent waste, fraud, and abuse. 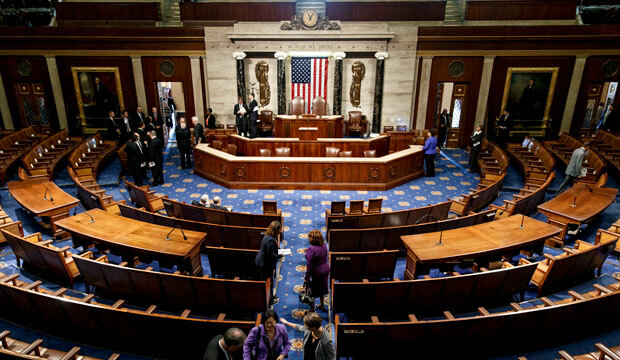 Congress employs tens of thousands of people in several legislative branch agencies to provide the support and expertise necessary to carry out this enormous responsibility, as well as the many other responsibilities the Constitution assigned to Congress. This includes advisors for the members and committees of Congress, as well as investigators at the GAO; fiscal experts at the Congressional Budget Office, or CBO; and the Library of Congress, including its world-class experts within the Congressional Research Service, or CRS. The clearest example of legislative branch cuts that increase budget deficits are cuts at the GAO, which produces widely respected audits, investigations, and reports about federal programs. The GAO saves taxpayer dollars when Congress or the executive branch acts on its findings and recommendations. The GAO has a strong reputation as a competent and nonpartisan agency, and progressives and conservatives alike approvingly cite its reports. For example, Sen. Tom Coburn (R-OK) uses GAO reports to highlight duplicative government programs, while Sens. Tom Harkin (D-IA) and Patty Murray (D-WA) point to GAO recommendations to increase the effectiveness of education programs for homeless children. GAO reports provided evidence supporting many of the deficit-reducing policies incorporated into the Bipartisan Budget Act of 2013, which partially replaced the sequester for two years, and GAO recommendations led to savings in major government procurement programs, such as the U.S. Department of Defense’s Joint Strike Fighter program. The best source for a detailed understanding of GAO’s financial benefits is its most recent strategic plan, which was published in 2010 and analyzed GAO performance in FY 2009. This report states that every dollar spent at the GAO in FY 2009 returned $80 to the federal government, a very high return on investment that demonstrates the major effect that GAO reports have on public policy. However, GAO reports may be just one of many factors that contribute to a change in law. This issue brief only includes return on investment from cases in which “agencies acted on GAO information to improve services to the public,” accounting for 19 percent of the financial benefits the GAO reported for FY 2009. Therefore, this paper estimates that every dollar cut from the GAO budget costs the federal government $15.20 due to inefficiencies that are allowed to continue, or 19 percent of $80. From FY 2011 to FY 2014, annual budget cuts at the GAO have totaled $253 million relative to inflation-adjusted FY 2010 levels. If every dollar cut meant that $15.20 in savings was never found, then these four years of budget cuts have cost the country nearly $4 billion. In addition to the GAO, several other legislative branch agencies play a critical role in the U.S. political system as nonpartisan sources of expert information and judgments. CBO produces widely accepted projections of the current fiscal outlook, as well as cost estimates for new legislation. The Joint Committee on Taxation, or JCT, produces similar estimates for the revenue impact of tax bills. CRS acts as an in-house think tank for Congress without any political agenda. There are not many institutions with the credibility to act as referees in political disputes to determine which information is accurate. While the public may have a very low opinion of Congress, the institutions established by Congress within the legislative branch have built a strong reputation as nonpartisan referees. Politicians will always debate whether new spending or tax cuts deliver enough benefit to justify their fiscal impact, but they are less likely to debate how large that fiscal impact actually is—CBO and JCT estimates are generally the final word on this question. The GAO delivers clear-eyed assessments of how well a federal program is working, without having an axe to grind as either an advocate or opponent of the program. CRS is often the first place a congressional office will turn to understand an issue. These agencies can certainly be wrong—referees are not perfect—but they do their best to avoid any political bias. These nonpartisan institutions are all damaged by budget cuts, with legislative branch funding in FY 2014 down about 15 percent from FY 2010 levels when inflation is taken into account. Those cuts also degrade the quality of advice that members and committees of Congress receive from their own staff, since budgets cuts force fewer staff to cover more issues and make it more difficult to attract and retain quality staff. Unfortunately, the decline of expertise within the legislative branch has been happening for 20 years, as detailed in a recent Washington Monthly article, titled “The Big Lobotomy.” The GAO and CRS have lost thousands of staff since 1993, while the professional staff serving congressional committees has shrunk 39 percent. In 1995, Congress closed the Office of Technology Assessment, which analyzed new science and technology issues, forcing Congress to rely more heavily on experts working for interest groups. The recent struggle to launch HealthCare.gov and the ongoing failure to link the electronic health record systems of the U.S. Department of Defense and U.S. Department of Veterans Affairs suggest that Congress would benefit from better advice on technological challenges. To stop waste, fraud, and abuse, Congress needs to invest in the IRS, inspectors general, and program integrity. But most importantly, Congress needs to invest in its own competence. Harry Stein is the Associate Director for Fiscal Policy at the Center for American Progress. Hilary Gelfond was formerly an intern with the Economic Policy team at the Center.